Fieldwire is a construction management solution that delivers a precise tracking of site issues and project deficiencies to bridge the gap between the field and the office team. Tracking and managing deficiencies in projects and tasks in the construction industry is a tedious process. There is a need for effective and efficient collaboration between the field and the office team in monitoring and managing site tasks, and that’s exactly the problem this system is trying to solve. 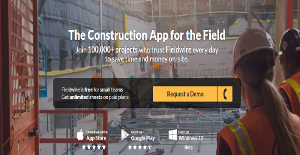 Fieldwire is a mobile and web-based construction site task management and plan viewing solution that aids engineers, site supervisors, foremen, contractors, and subcontractors to track issues involved in site tasks and projects in order for them to implement the necessary remedies. Besides providing an easy to find location of pertinent project site documents, plans, and reports; Fieldwire provides functionalities that optimize handling of task issues including the documents associated with them. A distinct feature of Fieldwire as a construction site task management software is its blueprint management feature. This feature includes viewing of plans as well as versioning them and it allows users to efficiently manage their construction drawings and plans. With this feature, users can import their plans directly from their computers and resolve version conflicts. Users have the option to confirm whether a particular plan is a new version of an existing plan or not. If a plan is confirmed as a new version, all other similar plans having version conflicts can be automatically updated as new version using the resolve version conflict option in the software. This feature is an efficient way to optimize blueprints and construction plus reducing the cost of organizing them. Fieldwire also has an effective task management feature that allows users to create punch lists of tasks and speed up the construction closeout process. In this feature, users can import a checklist of items to determine if there are some deficiencies within a task that need to be work on. Any issues and deficiencies observed are then assigned to respective site team members with the addition of some markups, photos, and documentation so that team members can know exactly what they need to do. The software also enables users to easily check whether or not an item in a punch list or a task is already completed. This feature improves collaboration among construction team members with the aid of instant notifications and document sharing. If you are considering Fieldwire it may also be beneficial to check out other subcategories of Best Construction Management Software collected in our base of B2B software reviews. Each company has different wants and requires an application that can be customized for their size, kind of staff members and buyers, and the specific industry they are in. For these reasons, no platform can provide perfect tools out-of-the-box. When you search a software product, first be sure what you want it for. Read some Fieldwire reviews and ask yourself do you need basic tools or do you want complex features? Are there any industry-specific features that you are seeking? Find the answers to these questions to help your search. There are lots of factors that you need to consider and these include your budget, particular business requirements, your organization size, integration needs etc. Take your time, use a few free trials, and finally choose the app that provides all that you want to improve your firm competence and productivity. How Much Does Fieldwire Cost? We realize that when you make a decision to buy Construction Management Software it’s important not only to see how experts evaluate it in their reviews, but also to find out if the real people and companies that buy it are actually satisfied with the product. That’s why we’ve created our behavior-based Customer Satisfaction Algorithm™ that gathers customer reviews, comments and Fieldwire reviews across a wide range of social media sites. The data is then presented in an easy to digest form showing how many people had positive and negative experience with Fieldwire. With that information at hand you should be equipped to make an informed buying decision that you won’t regret. What are Fieldwire pricing details? What integrations are available for Fieldwire? Fieldwire works with file sharing and storage platforms such as Dropbox and Box. It can also be integrated with Google Drive and Microsoft Excel. If you need more information about Fieldwire or you simply have a question let us know what you need and we’ll forward your request directly to the vendor.